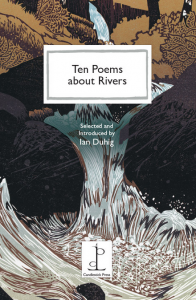 A handsome and gift-able multi-angled tribute to the shape-shifting of rivers, poems by Eavan Boland, Kayo Chingonyi, Ian Duhig, Philip Gross, Kathleen Jamie, Zaffar Kunial, Beth McDonough, Eiléan Ní Chuilleanáin, Pascale Petit and Julian Turner - edited by Ian Duhig, published by the Candlestick Press. Cover illustration by Ian Phillips. £4.95... which sends a donation to The Rivers Trust.